As Vic and Bob would say: Look at the size of that trophy !!! 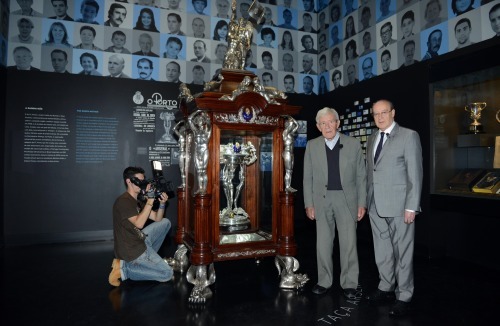 Very recently the only one man still alive from the match, the Portuguese substitute Sanfins, currently aged 92, visited FC Porto’s museum to see the trophy he helped to win. Imagine the esteem a club would have to be held in by its opponents if, after beating the revered team, the victors commissioned an intricate nine-foot trophy in honour of a solitary friendly win. That was the position in which Arsenal found themselves in 1948 when they were defeated 2-3 in May by Oporto (now known as FC Porto). The victory led to the creation of a trophy called The Arsenal Cup, but to see how we got to this position we need to go back to 1925. In 1925 Herbert Chapman was appointed manager and worked to a five year plan. This plan ensured Arsenal picked up their first ever trophy in 1930, and the club did not look back winning the League and FA Cup enough times to appear in seven of the nine Charity Shields during that decade. The system set in place by Chapman was so sturdy that it survived his untimely death in 1934 and the Second World War, as the trophies kept on coming under first Joe Shaw, then George Allison and, finally, Tom Whittaker. The footballing media make much of the Liverpool “boot room” set up by Bill Shankly, but Chapman had created his own one 40 years previously. 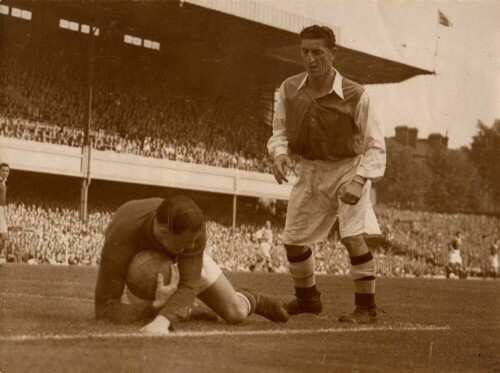 Arsenal had again just been crowned as League champions, where 33 goals from Ronnie Rooke and 14 from Reg Lewis had contributed greatly to the triumph in Whittaker’s first season as boss. This win also coincided with the return of Joe Shaw to the management team, having been released at the start of the war when the reserve team was disbanded. Shortly after their record equalling sixth League triumph Arsenal embarked on a short tour of Portugal, with the well-earned reputation as the most powerful team in Europe, if not the world. The Portuguese were also smarting from a 10-0 hammering dished out by the English in an international match the previous year. They flew into Lisbon and, while there, easily defeated Benfica 4-0 on 3rd May and had a spot of sightseeing in Estoril, before flying onto Oporto for the game on the 6th. This game was played in the Estádio do Lima in front of a capacity 20,000 crowd, almost on the touchlines, where, despite it being a friendly, few gave the home team any chance. Arsenal fielded a strong team but were without the Compton brothers, Leslie being injured and Denis was given leave by Whittaker to put in some net practice as there was a forthcoming Ashes series in England that summer. Leslie was replaced by Lionel Smith and Denis by Ian McPherson, despite suffering from a nasty insect bite on his right hand. However, in the broiling heat and dazzling sunshine, the Gunners appear to have underestimated the Dragons, as they quickly shipped three goals and were lucky to go into the half-time break with the same deficit. As early as the ninth minute a 30-yard thunderbolt from the Oporto star player, Antonio Araujo, sailed into the top left hand corner of George Swindin’s goal via the post. Then Oporto’s 16 stone forward Correia Dias scored in the 20th minute with a powerful shot after Araujo had played him into position, and the same combination was responsible for the third goal in the 32nd minute. During the break Whittaker made two substitutions: replacing Lewis with Rooke whilst Bryn Jones came on for Alex Forbes, and this had the effect of rallying the team for the second half was an avalanche of Arsenal attacks. Both Arsenal goals were scored by the substitutes, with Rooke netting in the 63rd minute and Jones with almost the last touch of the game as he headed in a Roper corner. The game reached boiling point when, following a string of impressive saves, Oporto’s goalkeeper Frederick Barrigana grabbed hold of Rooke, who took umbrage, resulting in a bout of “handbags”. Heaven knows what would have happened if there was more than personal pride riding on the game. During the final quarter of an hour tempers frayed with the pressure of Oporto holding on for a famous win, and their players resorted to a number of time wasting tactics which the referee duly noted and in added time the crowd became agitated too. The atmosphere was electric, the crowd whistling loudly for the game to finish, and at the end the well dressed crowd threw their seat cushions in the air, at each other and on to the track surrounding the pitch. After the game the teams were treated to a number of receptions by the British Consul, the Civil Governor and a “splendid and merry banquet” from the Mayor of Oporto. 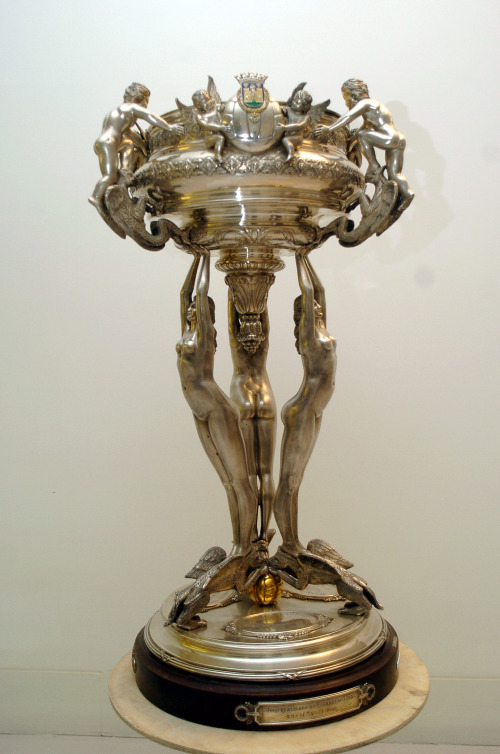 Having restored the nation’s pride, Oporto decided to create a trophy called The Arsenal Cup, whereby the club, wishing to perpetuate their historic win, requested that all important jewellers in Portugal put in tenders for the monumental icon, which was estimated, initially, to cost 70,000 escudos, though it is likely to have cost far more than that when finally completed. Such was the clamour in Oporto that 60,000 escudos had been raised by public subscriptions within a few months of the game – this figure is the approximate equivalent today of £200,000. The Arsenal Cup was designed at Ourivesaria Aliança in Porto, crafted by Marinho Brito and Albano França and it arrived at the club almost a year and a half after the game. To describe it as “cup” is possibly one of the biggest understatements in football. The unique and quite magnificent trophy, and equally intricate presentation cabinet, is currently displayed at the FC Porto Museum. Weighing 250kg, it contains 130kg of pure silver and is 2.8 metres tall. Other material such as gold, enamel, crystal, fine wood, marble and velvet were also used in its production. The trophy itself is entirely silver and consists of three sculptured figures of women rising on tiptoe holding the cup, with three athletes reaching towards the cup looking to drink the wine of the victory. It is housed within a glass cabinet with a wooden frame, supported by four silver dragons allowing the trophy to be viewed from all angles and the piece has many silver cherubs and figures holding up plinths. Atop is a silver sculpture which includes an athlete, kneeling and controlling a lion. In his right hand the athlete holds a flame aloft while in his left hand he holds the flag of FC Porto. Behind the athlete and dominating the entire piece is the figure of victory. If you are holidaying in Portugal and are near the ground this looks like being a great visiting experience! We would also like to thank Brian Smith for providing some great material that helped us write this article.